In 1890, the young German Emperor’s ambitions for his new country were perceived as upsetting the delicate balance of power in Europe that had existed since 1815. Tim Koch notes that a hackneyed metaphor has been given a boost by Brexit. 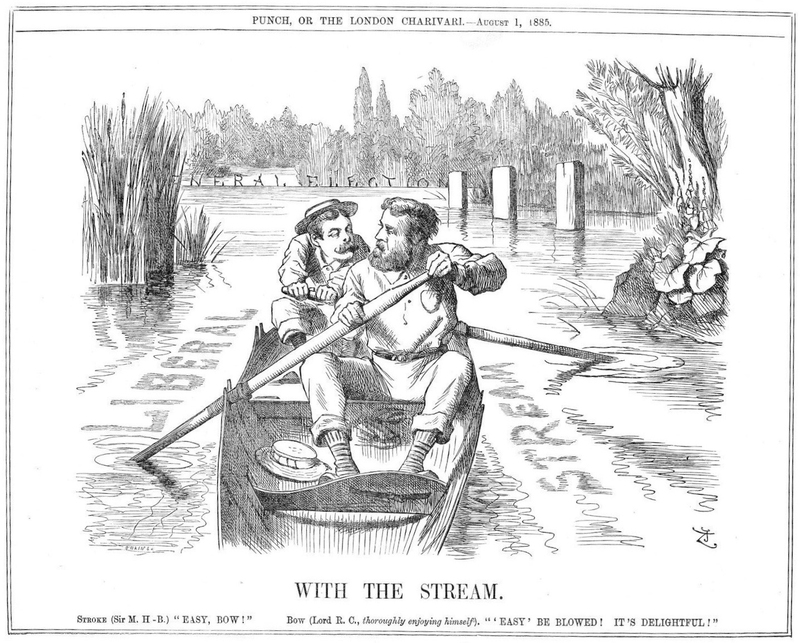 Hear The Boat Sing has looked more than once at political cartoons that use rowing as a metaphor. Hélène Rémond’s piece, “How a Cartoon of a Racing Shell Explains Britain’s Brexit” must be one of HTBS’s most viewed posts. 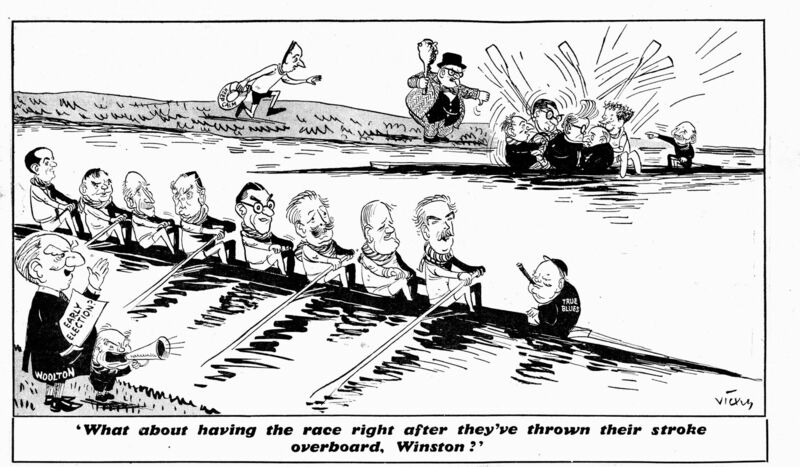 Göran Buckhorn has a lovely cartoon from 1964 in his post, “Up the Political Creek with Two Oars”. I have previously produced two such pieces, “Bite the Ballot” and “Electile Dysfunction”. 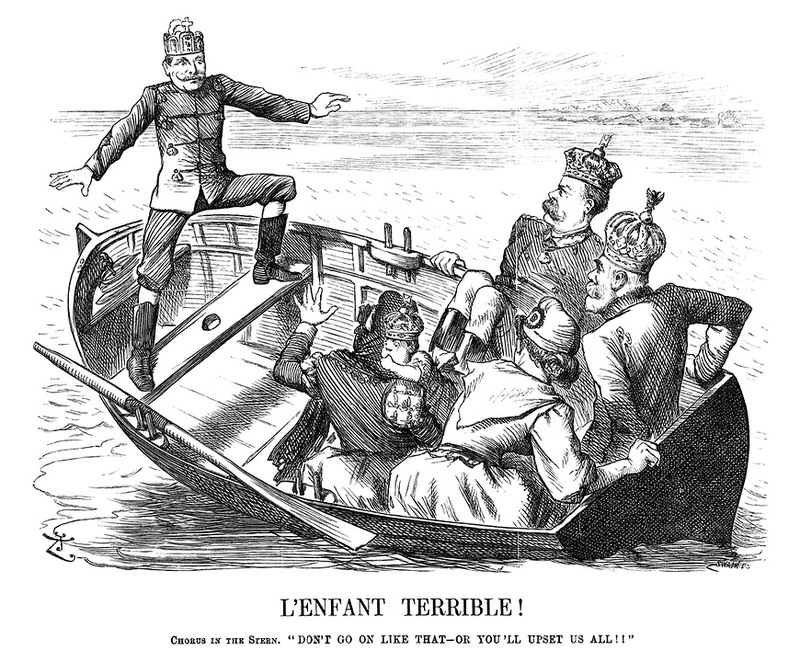 The above ‘L’enfant terrible’ cartoon of 1890 was not the first or last one to use a rowing boat as a political metaphor. 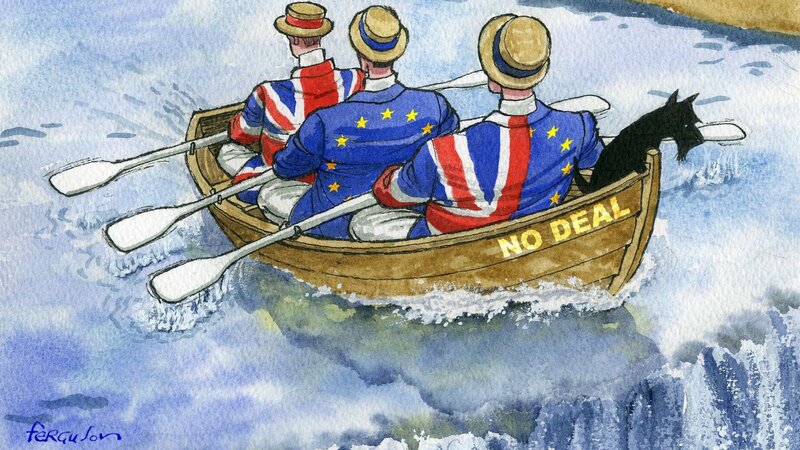 Few things symbolise the common political phenomena of a group that should be united failing to ‘pull together’ as does a crew inexpertly rowing ‘out of time’. 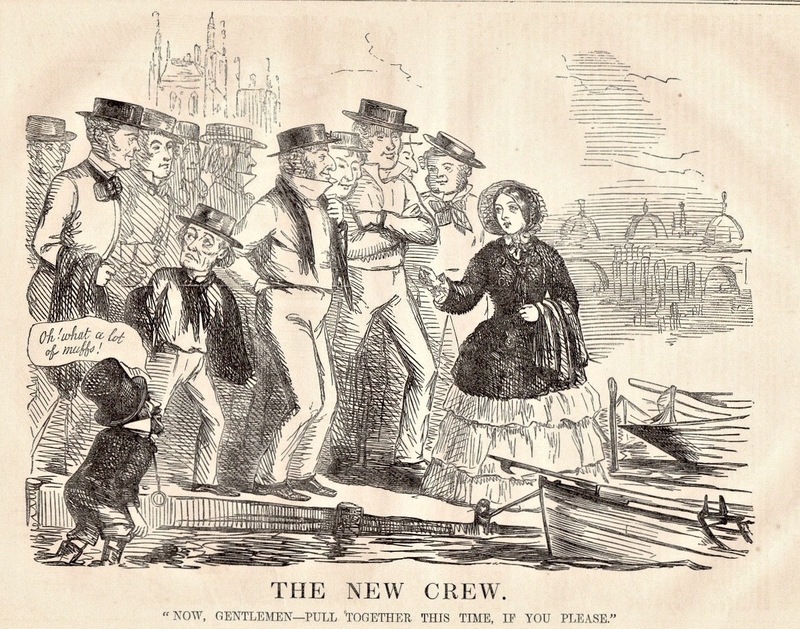 ‘Pulling together’, 1852. Queen Victoria urges unity in Lord Aberdeen’s new administration of 1852. Aberdeen formed his government from the coalition of Free Traders, Peelites and Whigs that had passed a vote of no confidence in the previous government. 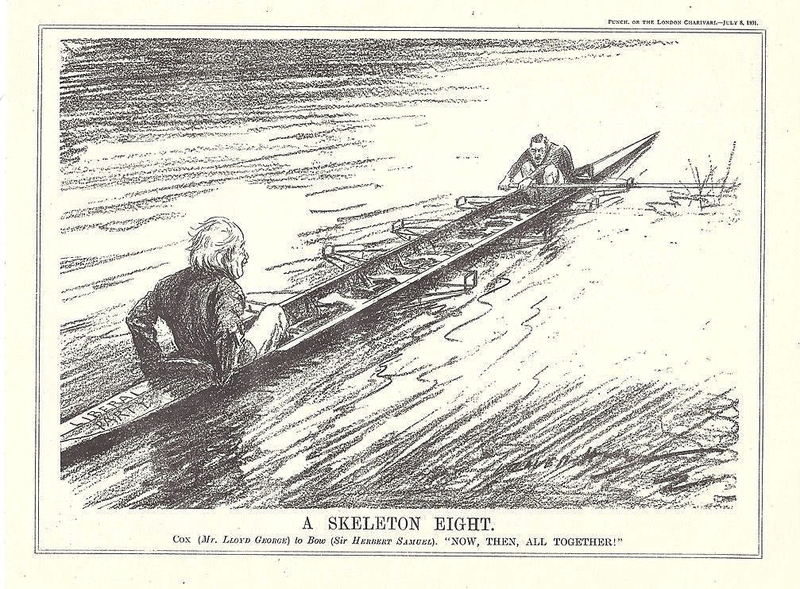 ‘Not pulling together’, 1903. 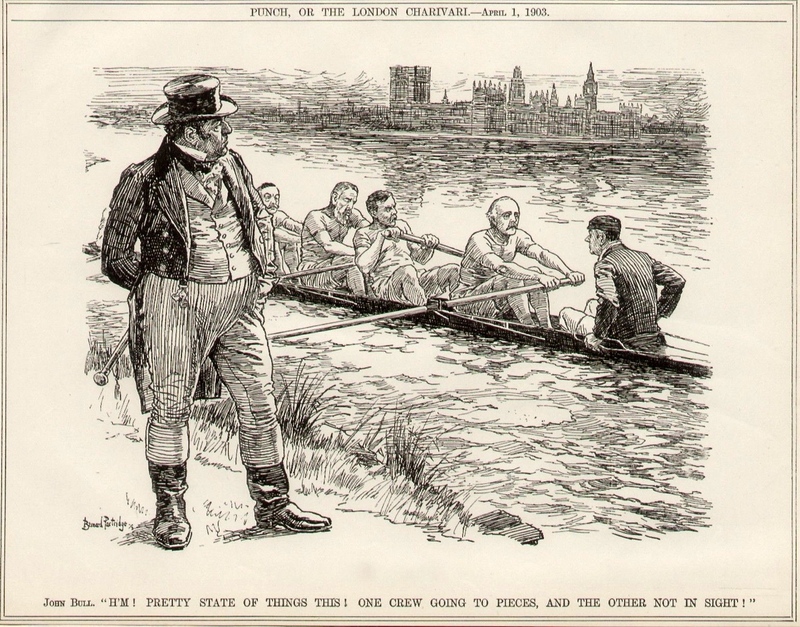 John Bull, the personification of Great Britain, observes that the Conservative Government is hopelessly split over free trade and that the main opposition party is bereft of ideas. Thankfully, those days are over. ‘Some pulling together, some not’, 1955. The Conservatives hope to take advantage of disunity in the Labour Party. In fact the Labour ‘stroke’, Clem Attlee (who took a keen interest in rowing matters), fought the 1955 General Election as Labour Leader, only resigning seven months later at the age of 72, having led the party for 20 years. The idea of a political leader as ‘stroke’ is a common and obvious one. Gladstone formed the second of his three administrations in 1880. He originally intended to retire at the end of 1882, the fiftieth anniversary of his entry into politics, but in the event did not do so. 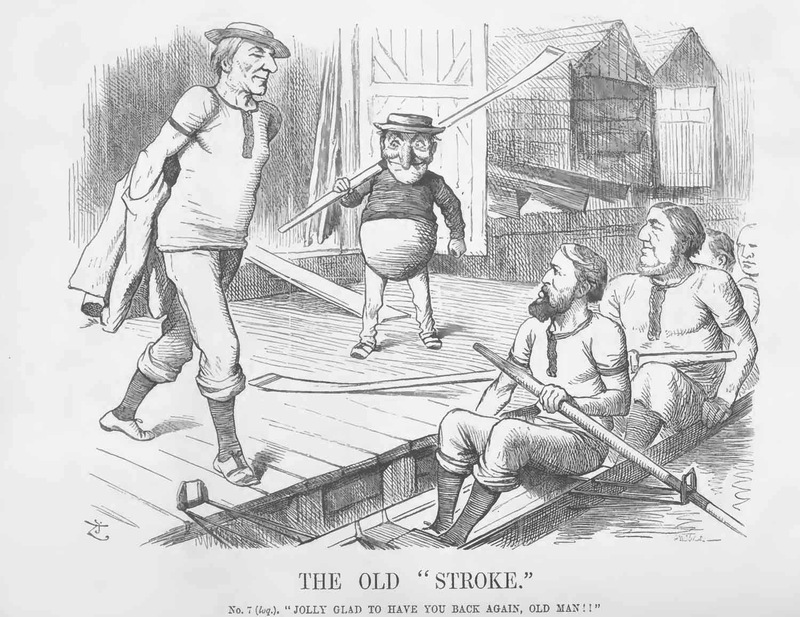 In this 1882 cartoon, he is welcomed back into the stroke seat. One of Britain’s great Prime Ministers, Gladstone was known affectionately as the ‘Grand Old Man’ or ‘G.O.M’. However, political rival, Disraeli, suggested that the initials actually stood for ‘God’s Only Mistake’. When Thomas Hudson translated ‘Du Bartas’ Historie of Judith’ in 1584, he formed a metaphor that equated being ‘in the same boat’ with ‘having the same fate’: ‘Haue ye paine? So likewise paine haue we: For in one bote we both imbarked be’. ‘All in the same boat’ or, in this case, ‘Not all in the same boat’. In 1931, a small group of breakaway ‘Independent Liberals’ led by the former Liberal leader, David Lloyd George, stood on a platform of opposition to the coalition National Government. The ‘same boat’ that we are all in can be rocked, lost, sinking, becalmed, heading for rocks, or about to go over an aquatic edge. 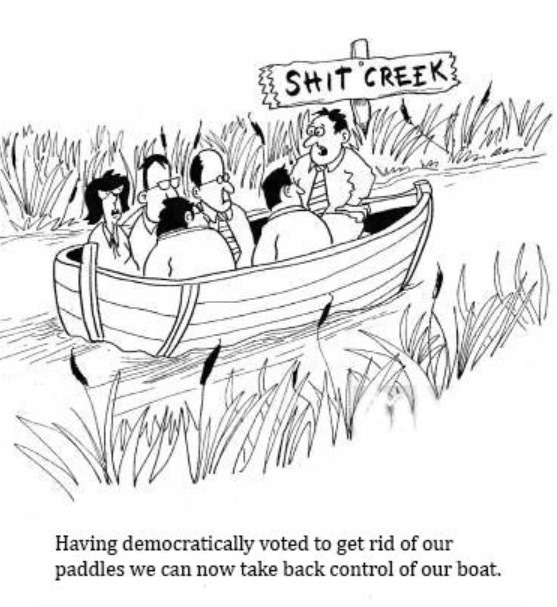 The latter is a particular favourite, cartoonists commonly have the idea that boats are frequently used very near to waterfalls or weirs and that their crews are generally oblivious to the problems that this can produce. A rowing boat is best used in this scenario as, naturally, the crew is looking the wrong way and is oblivious to the danger that is about to befall it. ‘Going over the edge’, 1885. Lord Randolph Churchill (the father of Winston) held that the Conservative Party ought to support, rather than oppose, popular reforms, challenging the claims of the Liberal Party to be the champions of the masses. This seemed particularly expedient as the 1885 General Election was to be the first in which a majority of adult males could vote. Despite this, the Liberals still won the election of November 1885. 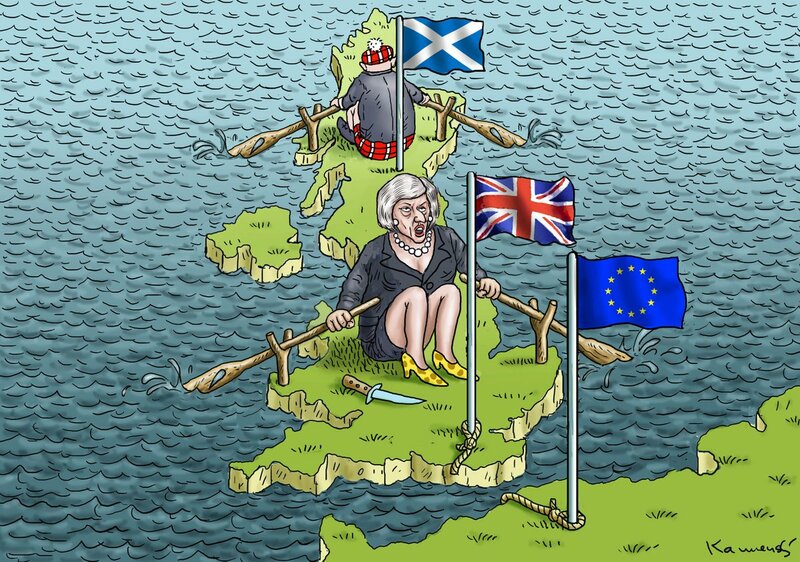 Britain’s Brexit debacle has given cartoonists from all over the world the opportunity to use (and perhaps overuse) all of their favourite rowing metaphors – here are a few of them. 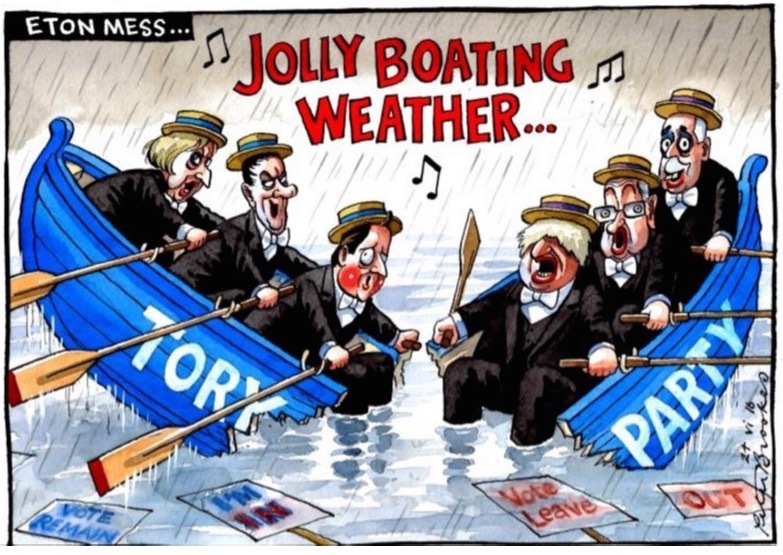 Peter Brookes in “The Times”, the day after the Brexit vote. 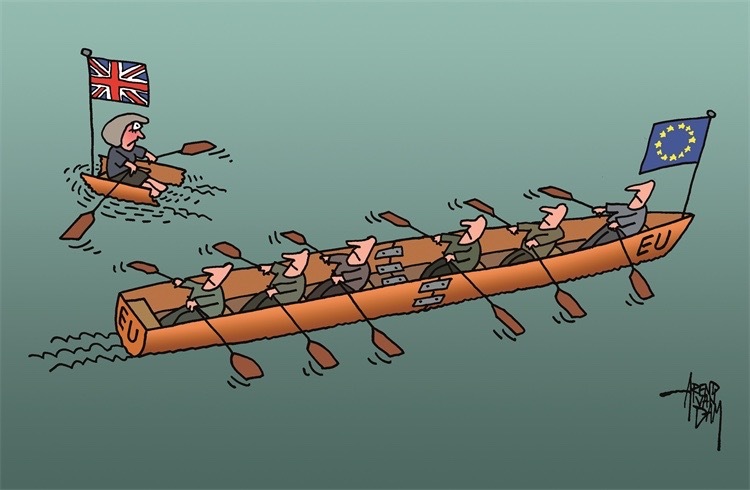 ‘Brexit – rowing away’ by Arend van Dam, politicalcartoons.com. The result of a ‘No Deal’ Brexit by Ferguson in the “Financial Times”. Axel Scheffler, a German who is the illustrator of the popular children’s book, “The Gruffalo”, has lived in Britain for 36 years. See more here. 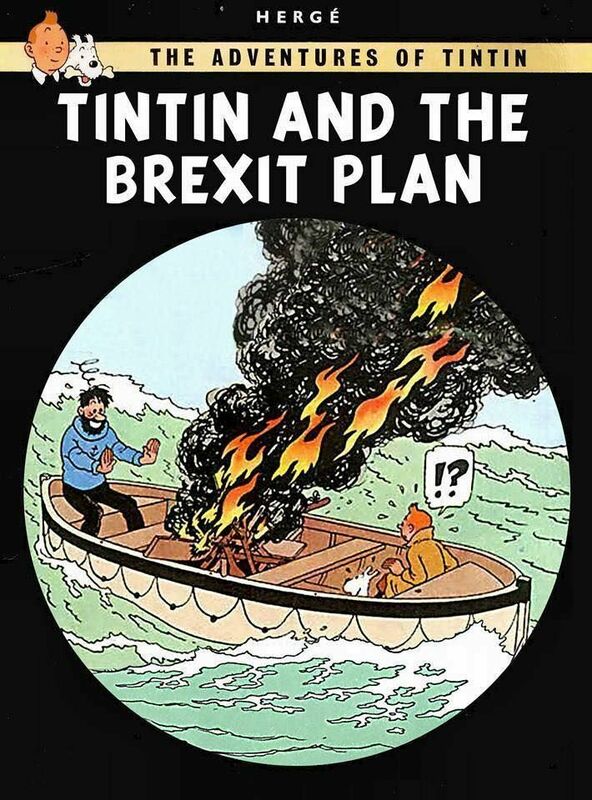 This popular social media meme is a manipulation of the real cover of a Tintin book. An illustration for an article on chinadaily.com.cn titled ‘May’s tough search for trading partners’. 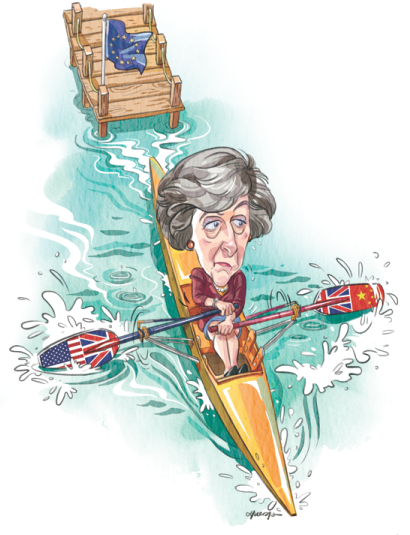 Perhaps Mrs May should be sculling away from and not towards the European dock. Of course, she could be ‘backing down’ – but is she capable of doing this? 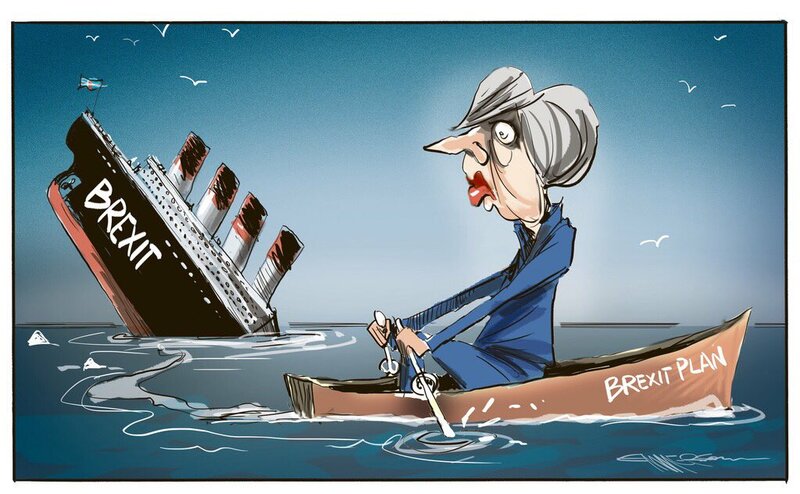 By Rod Emmerson in “The New Zealand Herald”. 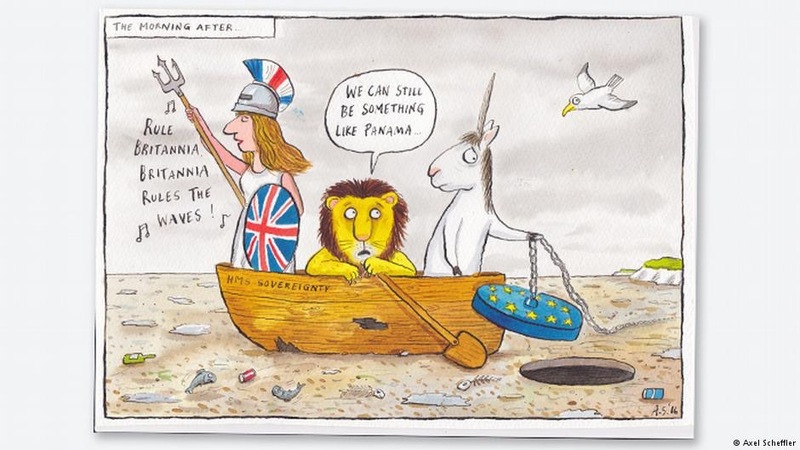 The final three cartoons have nothing to do with rowing, but I rather like them. The first, suggesting that Brexit is a disaster, conforms to the liberal metropolitan bias that I secretly try to indoctrinate all HTBS readers with. 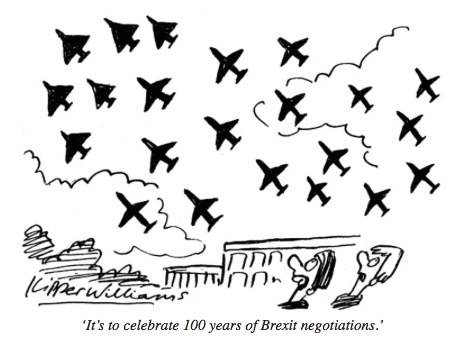 Witty, pro-Brexit cartoons are difficult to find but, in the interest of balance, I also include the second, something that may be suggesting that Brexit is a good thing – or it is just having a bit of fun? I suppose it depends on your view of the 45th President. The third and last cartoon references one of the few feelings relating to Brexit that everyone will agree on: please make the talking stop! 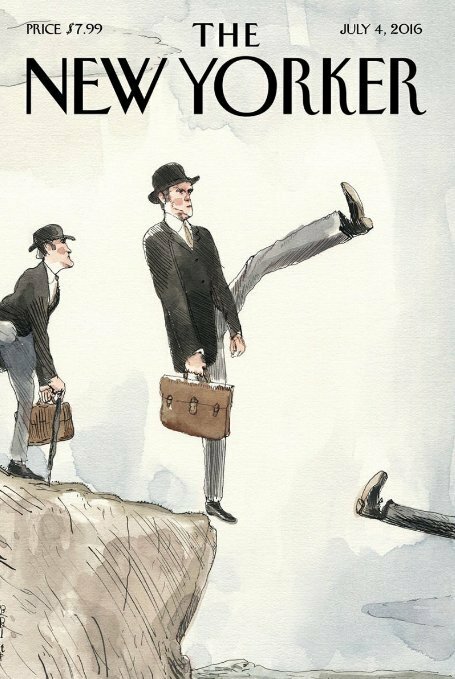 This “New Yorker” cover uses Monty Python’s John Cleese and his ‘silly walk’ character, a stereotypical Englishman, about to step into the abyss (though Cleese actually supports Brexit). 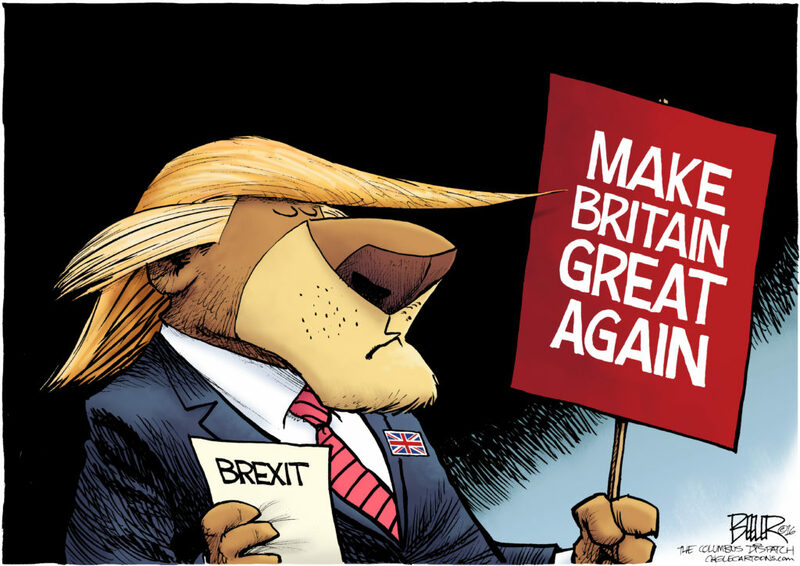 One American’s view of Brexit by Nate Beeler, first published in “The Columbus Dispatch”. Kipper Williams in “The Spectator”. The above cartoons are reproduced for non-commercial and educational purposes. However, if you own the rights to one of them and would like it taken down, we will do so immediately.